New Buffalo was one of the most successful of the collective farms that dotted the country in the 1960s and 1970s. 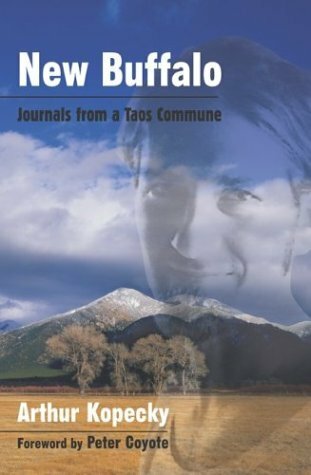 Arthur Kopecky's journals take us back to that era as he and his comrades wend their way to the area near Taos, New Mexico, where they encounter magic, wisdom, a mix of people, the Peyote Church, planting, and hard winters. The journals trace the groups evolution to adulthood as the party mood of the early 1970s gives way to the concerns of maintaining a growing farm. By 1975, several hundred people had called New Buffalo home and the business turned away from their counterculture goats, focusing, instead, on dairy cows. New Buffalo was emblematic of any number of communes where people came together by happenstance and grew a life together. The struggle and costs, the hard work, the endless labor and attention required to be self-sufficient; the learning of new skills, social and physical, that made every day an adventure are all here. . . . Remember or learn what it felt like to be young, optimistic, empowered and dedicated to making a better life. You will be amazed to see what persistent, dedicated, selfless, hard work can accomplish. Published by New Mexico Press in February 2004.